Heady Duty Cleaning in a compact commercial vacuum with its On-Board tools, Telescopic wand, 8' (2.5 m) flexible hose and 50' (15 m) Power Cable. The two(2) front swivel casters/wheels allow this vacuum to adapt efficiently to your vacuuming style. The 12 L (3.2 gal) tank capacity, its powerful 105" water lift capability, its 1100 W motor, and its maneuverability gives this compact commercial vacuum the ultimate tool to have for heavy duty cleaning. We've packed high-powered cleaning into this deceivingly small canister vac. Cut around obstacles and corners while the cyclonic filtration lets you roll through any mess. Tackle tricky hard floors and crevices with its specialized attachments then dump the dirt right where it belongs with the bottom empty dirt cup. 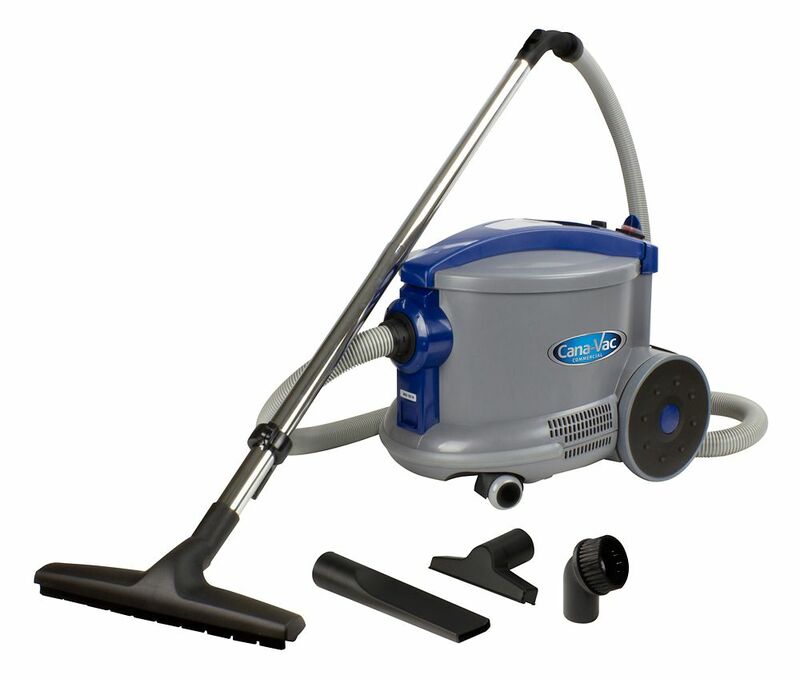 Commercial Canister Vacuum from Cana-Vac, 3.2 gal (12 L) Tank & Accessories Heady Duty Cleaning in a compact commercial vacuum with its On-Board tools, Telescopic wand, 8' (2.5 m) flexible hose and 50' (15 m) Power Cable. The two(2) front swivel casters/wheels allow this vacuum to adapt efficiently to your vacuuming style. The 12 L (3.2 gal) tank capacity, its powerful 105" water lift capability, its 1100 W motor, and its maneuverability gives this compact commercial vacuum the ultimate tool to have for heavy duty cleaning.